Lawyers are flocking to the cloud and tablets like crazy! But this transition is not without many questions and concerns, and the number of attendees looking for these answers was high at ABA TECHSHOW this year. Not only did I present the opening session in the Cloud Computing track, entitled, “How to Stay Safe in the Cloud.” I also, witnessed first-hand the largest number of attendees ever with tablet devices! The popularity of these topics seems to have only been rivaled by the numbers turning out for the Solo and Small Firm track, which included hot topics on going paperless and being more productive. Besides the cloud and tablets, attendees were also seeing a shift in workflow techniques being focused upon, and a number of document assembly vendors got a lot of attention at this year’s conference. E-discovery and Advanced Topics like virtualization and mobile device management were also popular. The conference was not shy with social events to help with networking either. The conference was kicked off with a 6-minute- 5-slide program called LexThink.1. Attendees voted on who would get to present, and there were no disappointments. Steve Best, a Georgia lawyer, legal technology consultant, and new fellow TECHSHOW Planning Board member was one of the presenters, and did a great job with his session on “Passion” in the limited time and slides he had! Each night, attendees could go out to a dutch-treat dinner called Taste of TECHSHOW with key presenters to learn more about topics presented in the educational tracks. These dinners were popular and sold-out, too! Okay, here’s my Ben Stein story! After Ben Stein’s name came up as a potential keynoter in our spring TECHSHOW Planning Board meeting last year, I got on a city bus for a self-guided tour of the Palm Springs, CA area upon the recommendation of a bus driver I had encountered earlier. To my great surprise, Ben Stein steps out of a department store elevator on one of my detours to an area mall. We chat and exchange contact information; the ABA Law Practice Management Section leadership negotiates a contract; and Ben Stein delivers one of the most rousing (even with no rosy predictions us attendees) Keynotes of any ABA TECHSHOW ever! 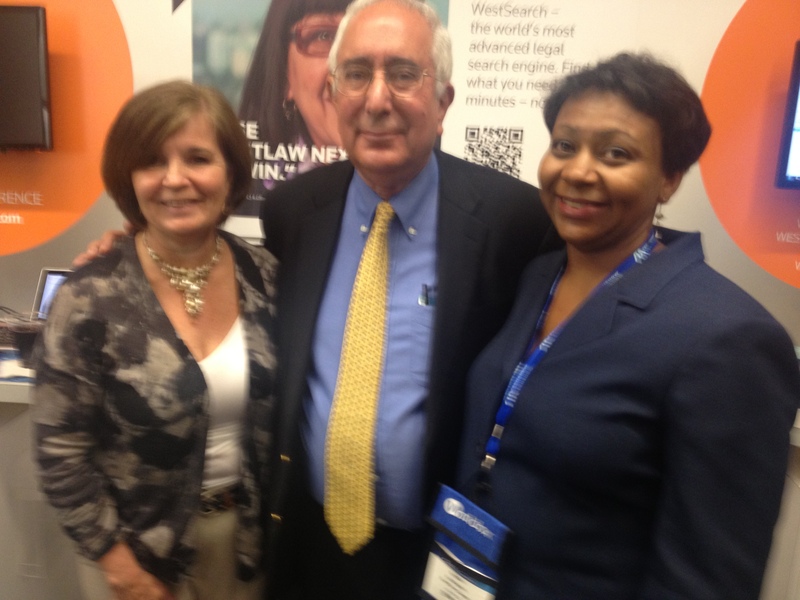 Here’s a picture of Ben Stein, me, and Sheila Baldwin, the Bar’s Member Benefits Coordinator from my department, after his keynote presentation. My personal highlight besides being a “personal host” of sorts to celebrity, Ben Stein, was being able to meet and talk to Georgia Bar attendees about their plans to take what they were learning back to their practices, and making pledges to spread the word about the value they received from ABA TECHSHOW. I was happy to hear their ideas about the best way to get this information out to even more Georgia Bar members, and I will continue to work on this key objective as I take on my upcoming role as the Vice Chair of the 2013 conference, and Chair in 2014. So, I invite you to help me out. Let me know which legal technology concerns you have, questions you need answered, and how you’d like for us to help. You can also look on this blog for more in-depth information about legal technology in the near future! Previous postWelcome to your Georgia Practice Advisor! Next postFastcase and Its Hot New Stuff!